Home / college / computer / computer science / dev evangelist / expert / Interview / programming / tech / tech evangelist / twilio / A Day in Life as an Intern as a Developer Advocate at Twilio! 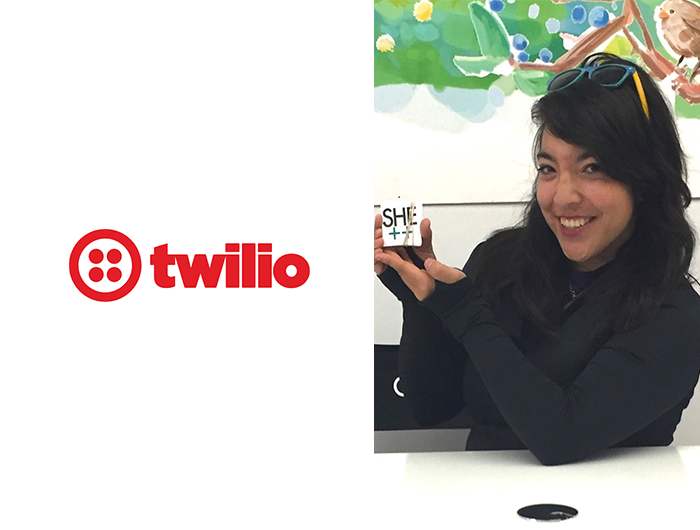 A Day in Life as an Intern as a Developer Advocate at Twilio! Lizzie is a senior at Bryn Mawr College majoring in computer science who has a tremendous amount of experience working both as a developer and an developer advocate. During her time in college, she was an intern as an iOS developer as Vea Fitness, intern at Twilio as a developer evangelist helping developers in the technical community utilizing Twilio technologies focusing on Python, Node.JS, Haskell, and Swift, and an intern at PubNub as a developer evangelist. Lizzie is also the Co-Director of Spectra, which is the largest women’s hackathon in the Bay Area at YouTube HQ in July 2016. Outside of academics and her passion in computer science, she plays tennis for her college. During her free time, she enjoys running long distance, playing table tennis, and tennis. Lizzie will be joining Twilio full time as a developer evangelist upon graduating this Spring. Please follow me on instagram @chapter1.io and like my page on facebook for the latest updates! Will be setting up a e-mail subscription update system this weekend (finally!). Thank you so much for interviewing with Chapter1.io! Let’s begin. How did you first get involved with programming? I was a total Humanities person growing up. My twin brother was the engineer of the family, and it always intimidated me. When I was barely passing AP calculus my senior year, my teacher told a group of girls in my class about Girls Teaching Girls to Code (GTGTC), a one-day, all-girls coding camp put on by Stanford students. I eavesdropped, and ended up being the only one who attended, thinking I had nothing to lose by trying. GTGTC kickstarted my interest in programming. The mentors were so diverse, debunking every stereotype I'd imagined them to be as computer science students. They showed me that code could be fun, creative, and applicable to almost every field. It was about problem-solving, and the process was similar to that of writing a story. I don’t remember much of what I learned that day, but I do remember how I felt: empowered and inspired. That event has influenced events I would later help organize, like She++ Code Day and then Spectra, a women's hackathon. Describe your role as a developer evangelist at Twilio. What did you work on during your internship? Describe your typical day at Twilio. What was the work culture like? I used to ask this question, too! There is no typical day for a developer evangelist. Most of us code everyday, but the amount varies depending on speaking, events or travel schedules, and more. Different tasks can include reviewing blog drafts, reviewing code, helping the education team with the docs platform, answering Stack Overflow questions, preparing a talk or workshop, applying to conferences, developing technical content, practicing an API demo, and more. The sky is the limit. The work culture definitely emulates that anything-is-possible mentality, but in a supportive and empowering way. It's truly a developer-centric company of DOers that works to support other DOers while having fun. What were some challenges you encountered as a developer evangelist at Twilio? How much programming is involved as opposed to your other tasks? A common misunderstanding is that a developer evangelist does not code. I've had to defend this to my major advisor a few times! That's one challenge--this is a very new field and we sometimes have to "draw the owl," which is one of Twilio's company values. If there's no instruction book on how to do our job, we feel empowered to figure it out ourselves. Another challenge is balancing time and priorities. When there's so much to do , it can be difficult to self-impose deadlines or balance different tasks. Programming is definitely the main part of the job. When you teach, write, and talk about code, you have to always be on top of your technical game and new frameworks, technologies, APIs, and languages. It's both fun, challenging, intimidating, and rewarding. With the advent of cloud based communication APIs in the recent years attempting to compete with Twilio such as bandwith.com and Nexmo who's costs are mostly cheaper than Twilio, how does Twilio maintain it’s edge to stay in the top of their industry? What do they do differently? I don't like talking about this because I don't want to sound sales-y, but we offer so many more APIs--both communication and non-communication ones-- now to make developers' lives easier and to get their apps up-and-running with less code. My teammate Sam Agnew had a friend who spent months building out Twilio Copilot features for his startup, and then we came out with Copilot for better number matching, message scaling, and more. Also, we have much less API downtime compared to competitors. If you're just doing bare-bones SMS and only care about pricing, you may be better off with another service. However, that is changing as we add on more features and services to every API. Working with many different audiences, what sort of trends do you see within the tech community? For instance, which technologies are most popular with the community and how do you, as a Developer Evangelist, react to that? You seem to be involved in a super impressive amount of activities aside from academics such as co-directing a hackathon especially at that scale. How do you effectively manage your time to be able to juggle many different activities at once? Honestly, up until this year, I did not sleep that much in college. I had this hustle mentality and thought that the more I worked, the better off I would be. Though it worked sometimes, it wasn't healthy--I'd doze off in-class and take lots of power naps when I had free time to refresh. I've tried different productivity apps, but almost always come back to a good, old-fashioned to-do list that I make each night and check off throughout the day. I also write out a schedule on paper. Another important thing to note--I love working with different developer communities through event-organizing, attending hackathons, making apps, writing posts, or trying out new APIs. I did these before I was a developer evangelist intern, starting in June 2016. It's honestly my dream job, so it's easy to do the work since I really enjoy it. Having wanted to be a teacher for most of my life before college, that aspect of working with developer communities especially resonates with me, and enjoying your work makes it feel not like work! Any advice or suggestions for our readers who want to become developer evangelists? My advice for aspiring evangelists is to attend meetups (meetup.com, or I share some in my newsletter https://tinyletter.com/lizziepika) and hackathons not just to network, but to learn new skills or technologies. That's how I've gotten so much inspiration for projects to work on. After you make something, write about it so others can make it, too. If you learn something, write about it or teach it to others. Event-organizing is also a plus. It's important to keep in touch with anyone you meet, and to not be afraid to ask questions. I've felt dumb sometimes, but everyone can't pick something up the first, second, or even third times. I wasn't the smartest undergraduate Teaching Assistant for Computer Science at my school, but I think that helped me better explain different concepts and answer different questions about assignments. Teaching, empathy, and patience are all important traits for this field. This is still a relatively new field, so you can "draw the owl" and make it your own.